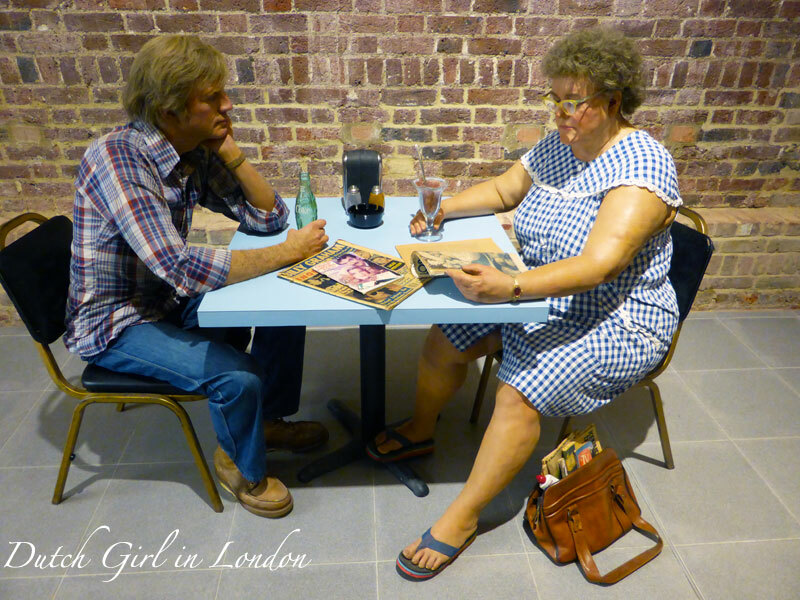 Until Sunday 13 September 2015 you can see the fantastic free exhibition of hyper-realistic sculptures by American artist Duane Hanson (1925-1996) at the Serpentine Sackler Gallery in London. A definite must-see! Flea Market Lady (1990/1994) the very first sculpture you see when you enter through the gallery doors. A great fun welcome! The retrospective showcases a selection of works from Hanson’s 40-year long career with pieces from 1979 till 1995. While his works early in his career were mainly life-size tableaux that depicted war and violence (for instance soldiers killed in action or police brutality), there was a shift in his work from the mid-60s. 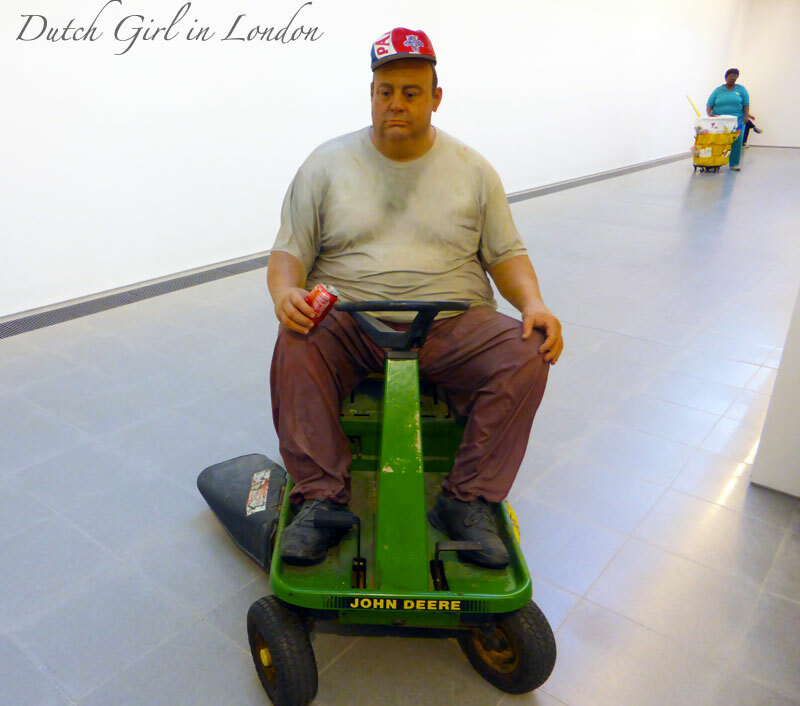 Like the works now at show in London, his sculptures started to depict everyday people to which Hanson added a flair of humour, satire and social awareness. This Cowboy (1984) stands across the flea market lady. 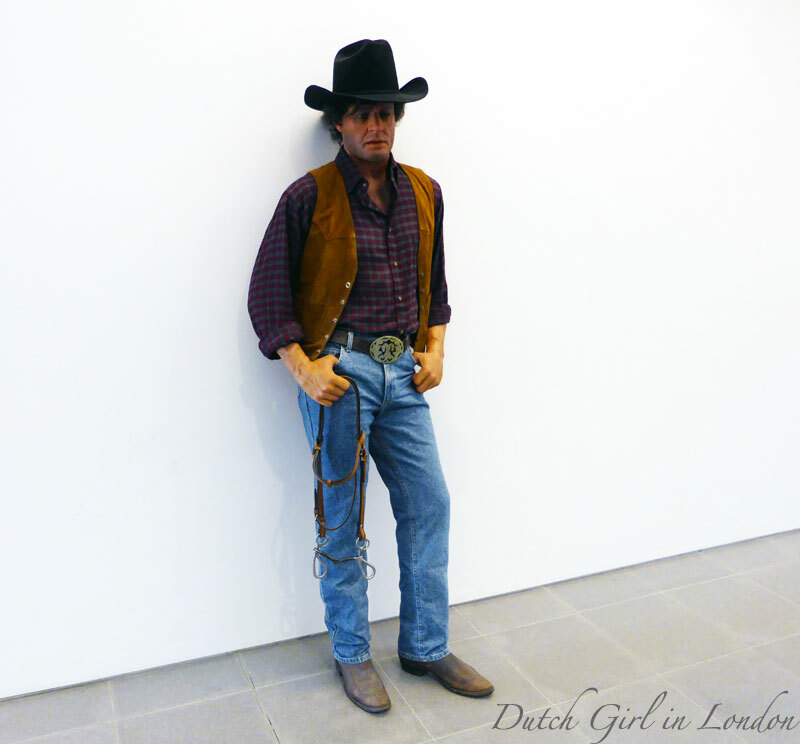 I have tis ‘thing’ for cowboys so I was very pleased so see this cool guy just right at the entrance. 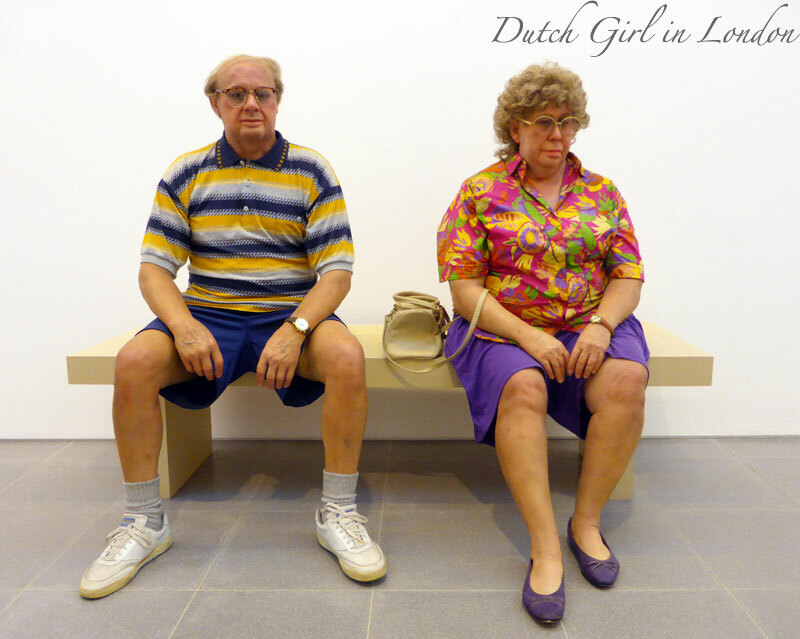 His sculptures of unsettling realistic human beings will give you goose bumps, not because they are scary, but because it feels like staring at a real person who might suddenly get up and move. 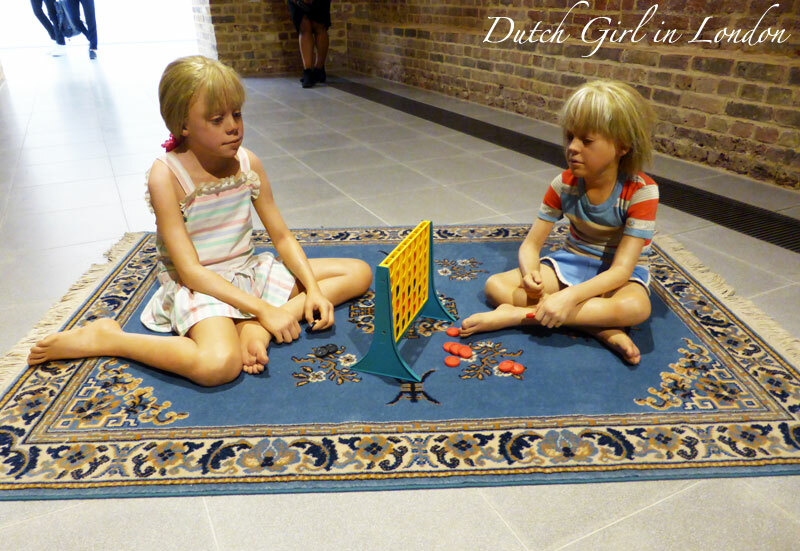 I found it especially creepy to walk past the installation Children Playing Game of two children playing Connect Four on a rug (I think I’ve seen too many horror films of dolls come to life!). It’s fantastic you can get very near the sculptures and study all the details in their skin, including veins and even bruises, from such a close distance. 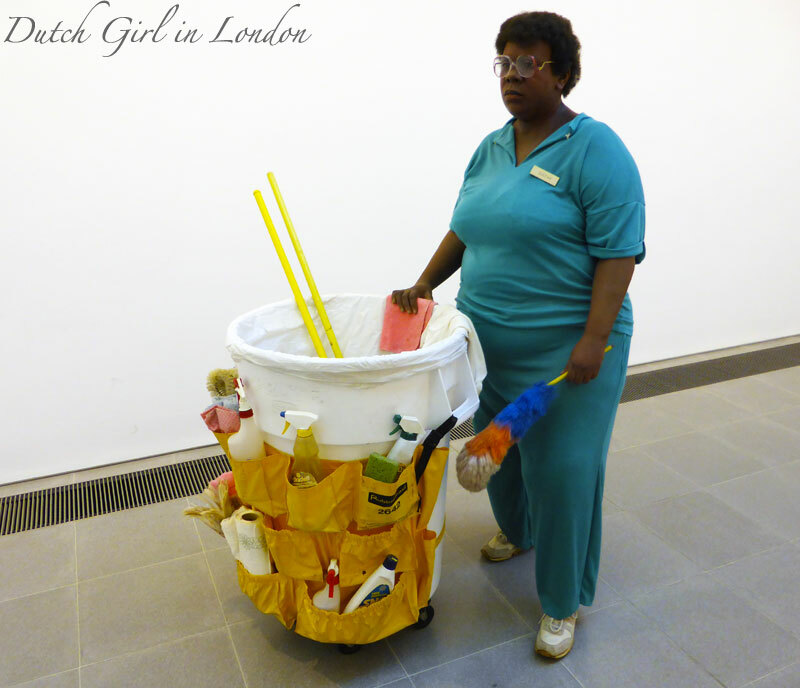 As I walked through the gallery and photographed the sculptures, I did several of double takes of sculptures and living humans alike. Some times I stared a few moments at a model to figure out if it was a sculpture or an actual person, but also the opposite happened as I almost took a photo of a person standing still in the corridor whilst he was waiting for someone and stared into the space. 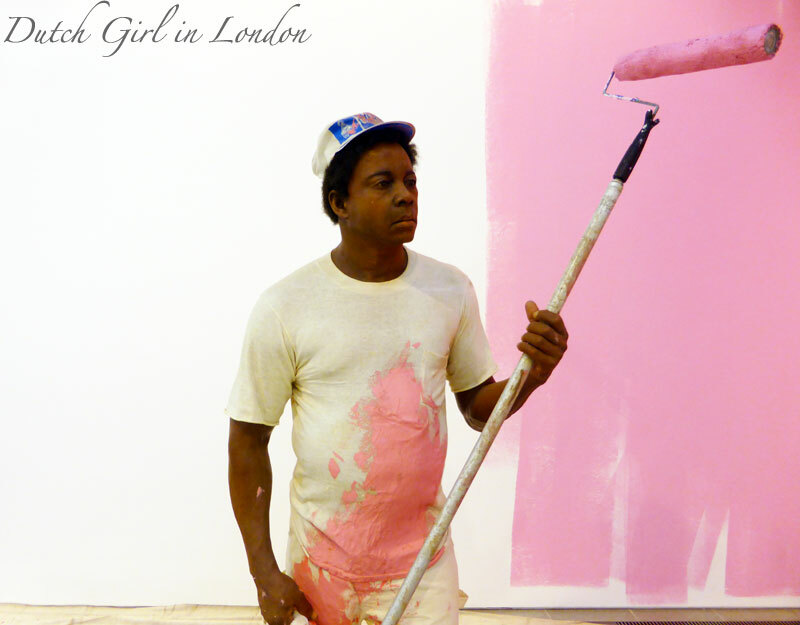 Hanson cast his real-life sculptures from live models, but didn’t make portraits of individuals. 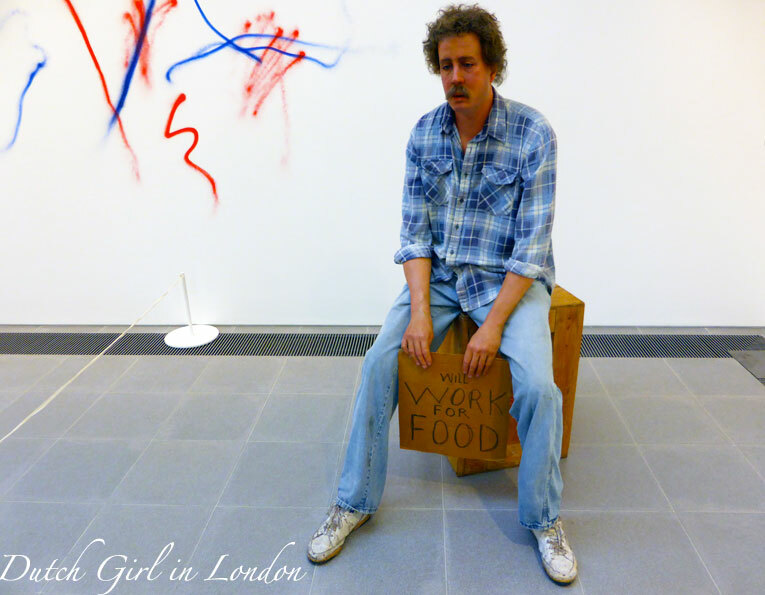 Instead they are archetypical portrayals of working-class Americans, “those that do not stand out”, overlooked members of society, the poor and the homeless. All of the sculpted individuals look either bored, tired, despondent and even disappointed in life. It’s incredible how much detail there is not only in the sculptures with their hand-picked clothes and accessories by the artist, but also their environment. 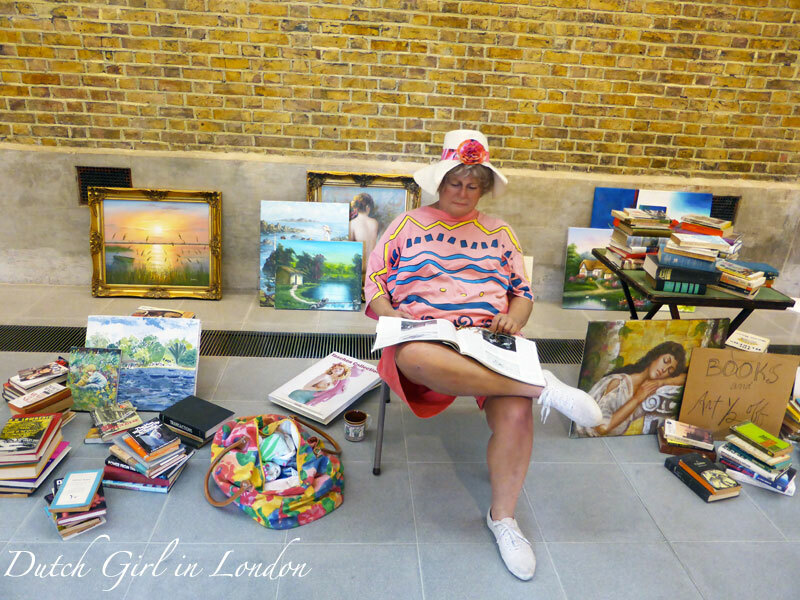 Take for instance Flea Market Lady (first photo in this post) and all her merchandise, hand-written sign and tea cup under her seat or the tiny pink paint speck on the cheek of the House Painter below. I put photos of all sculptures in this post for all of you who won’t be able to visit the exhibition, but the objects are best to be seen in real life. 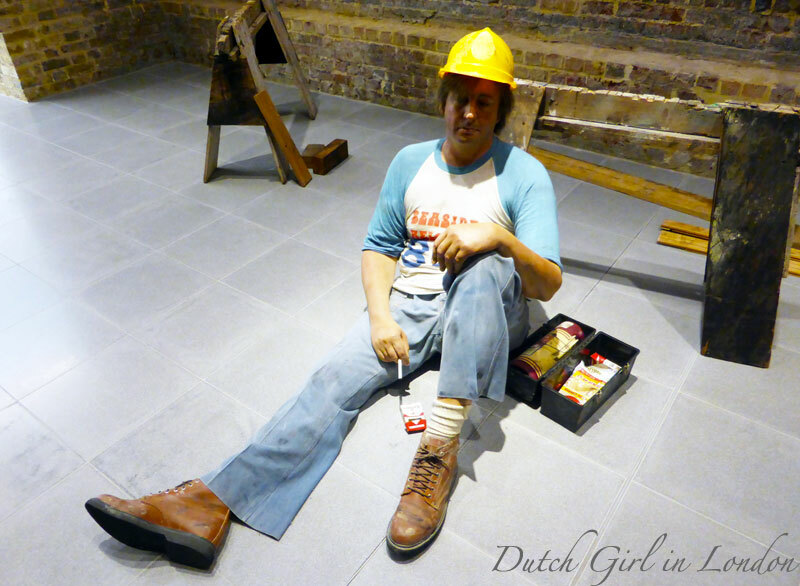 Only then you will see how life-like these people of polyester resin, fibreglass and bronze actually are. I can’t urge you enough to go and see the exhibition if you get the chance. You’ve got almost 2 more weeks to do so! 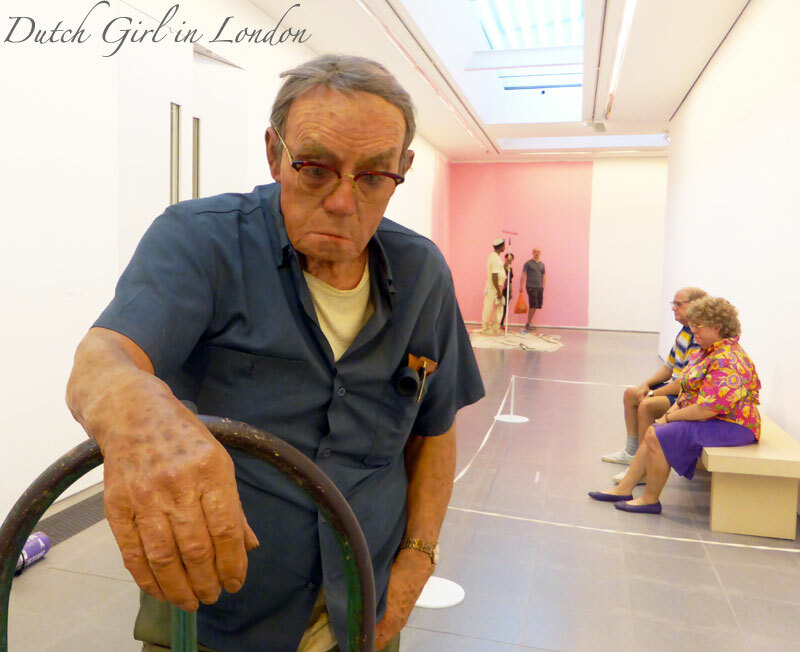 Posted in art and tagged art, Duane Hanson, exhibition, installation, London, sculptor, sculpture, Serpentine Gallery. Bookmark the permalink. What an amazing statues! So real and life-like! My very first thought after the first photograph was (like you wondered yourself): which ones of the attendants here at the expo are real people and which ones are sculptures? They are so detailed, amazing! I hope to read more of your posts the coming weeks, I am getting somewhat bored since I am in the hospital with a massive pneumonia. Had my first vacation in 27 years, 1 week in beautiful Twente, for the ill/disabled and had a fantastisch week! Home for 1 night and then straight through to the hospital with a fever etc. Getting beter now, slowly. Even with this, my vacation was great and for sure I will apply again next year! So I am looking forward to your posts even more than ever!